Hibs boss Alan Stubbs today described Saturday’s William Hill Scottish Cup final against Rangers as “the perfect game” for his players after the disappointment of seeing their promotion hopes vanish. Stubbs gave his squad time off following Friday night’s defeat by Falkirk to clear their heads before beginning to prepare for Hampden and he has no doubts that come kick-off they’ll be ready to try to end the Easter Road club’s 114-year wait for the trophy. The head coach said: “We gave them a couple of days off to get away from everything, to get over the disappointment very quickly and to then get ourselves ready for the weekend. Matches between Hibs and Rangers during the season saw both sides win their Championship games at home but the Ibrox club tasted success at Hampden in winning the Petrofac Cup and beating arch-rivals Celtic in the semi-final of the Scottish Cup while the Capital outfit, of course, lost the League Cup final at the same venue. But, Stubbs insisted, his players can use the experience of losing to Ross County to come out on top this time round. He said: “You have to learn from every experience, no matter what. Unfortunately in your football career, you are not going to got through it sampling only success. “You have to sample the disappointments as well and we’ve certainly sampled them this season. But that should make you stronger to go and sample success. “It won’t be for the sake of trying on Saturday. Come 3pm we will be ready to try to get the result we want. “The fact we have won twice against each other tells you everything about how tight it’s likely to be. 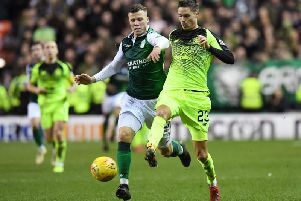 Hibs, meanwhile, have received a small number of additional tickets for the cup final with only a handful of their initial allocation of around 21,000 briefs yet to be sold. The tickets are now on sale to supporters with 1+ loyalty points. Full details of how to buy are on the club website.